Hoshin Kanri - OGSM - OKR: A case of apples and oranges when comparing? Let’s talk about strategy deployment methodologies: OGSM, OKR, Hoshin Kanri - what’s the difference? i-nexus’ Christian Loyer investigates. Despite the fact strategy deployment methodologies have been around for a while, it is only in the last few years that we have heard about specific forms such as OGSM, OKR and Hoshin Kanri when we speak of the most successful strategy executioners. Read on to learn why the core differences could boil down to terminology, and get the low down on their constituent parts. To begin, the most robust and complete methodology in the market today (according to me and many practitioners); Hoshin Kanri, has been around since the 1960s. Its author Dr Yoji Akao developed it after creating the Quality Function Deployment (QFD) / House of Quality, a tool that helps organisations improve their decision making. All of a sudden, Hoshin Kanri helped Japanese organisations think Top-Down in a more structured way, rather than only Bottom-Up with their Production Systems (Lean in today's language). BONUS – Want to go further into the differences between OGSM, OKR and Hoshin Planning? Join our upcoming webinar. Click here to book your spot. But why this resurgence on strategy deployment methodologies? And what are the differences between the dominant players? Well, we at i-nexus are ideally positioned to answer this question as we deal with organisations who have the same goal: to deploy their strategy in a much more disciplined way. After all, why invest so much in defining an amazing strategy with an army of consultants, off-site meetings at exotic locations, for that strategy to remain unexecuted? The answer is simple: the C-suite requires more discipline in executing strategies, and understandably so after too many promises to the market have not been met! Executing strategy is hard. Where do you start? How do you do it? How do we break down the vision into objectives and then into projects? Enter Hoshin Kanri (also sometimes called Policy Deployment), OGSM and OKR - not to mention other methodologies. Those methodologies are there to help organisations break down their strategy into actionable projects. In this article, I want to answer one of the more frequent questions I get asked when presenting Hoshin Kanri at conferences, webinars and seminars: what’s the difference between the methodologies? At their core, strategy methodologies all aim to achieve the same outcome: help organisations execute their strategy. The main difference is they use different languages and drill down to varying degrees. Here’s what that can look like from an OKR vs. Hoshin Kanri vs. OGSM perspective. 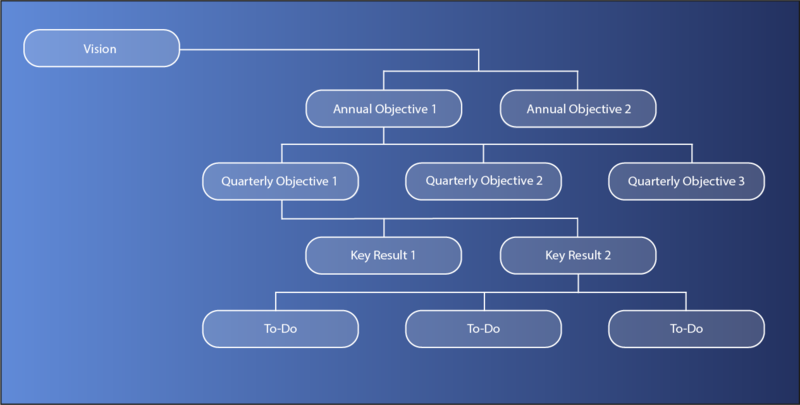 In this screen from our i-nexus strategy execution software, you can see that Breakthrough Objective 3 (BO3) has been broken down into Annual Goals and if we expand Annual Goal 8 (AG8), it has a subset of Improvement Priorities (IPs) which could be broken into further sub-objectives and projects. Here, IP03 has two metrics associated with it and a further sub-objective. This cascade can (but does not need to be) be endless, helping you drill down to very specific actionable items of work. For the sake of convenience, I have highlighted in green the route I presented to you earlier: BO3 > AG8 > IP03. And for those of you who have never seen the Hoshin-Kanri matrix, I will write a follow-up blog on this subject very soon. From this OGSM, direct reports to the SVP of Supply Chain Global, such as the regional VPs, will create their OGSM. In turn, the country Supply Chain Directors will create their OGSM and then the Plant Managers will do the same. The result is a massive PowerPoint deck that tries to capture the cascade of objectives. The arrows are there to give you a feel of how the different OGSM connect, not that this would be visible in a deck, you would have to figure this by yourself. My objective with this blog was not to give you a summary of the advantages or disadvantages of each methodology, but to answer the question: what is the difference between them? Well, first, let me say this is like comparing languages. At first glance, the words ‘good day’ and ‘bonjour’ look very different from each other, but if one speaks both English and French, one knows it means the same thing. The same is very true with strategy deployment methodologies: they all use a different language. For example in Hoshin Kanri, the vision is very often referred to as ‘True North’. Also true are strategies being referred to as ‘Initiatives’ in OGSM or ‘To-dos’ in OKR. And even that is not standard terminology; we have Hoshin Kanri clients who don’t use the terminology ‘True North’ as per its inventor, opting instead to use ‘Vision’ or even ‘Mission’. 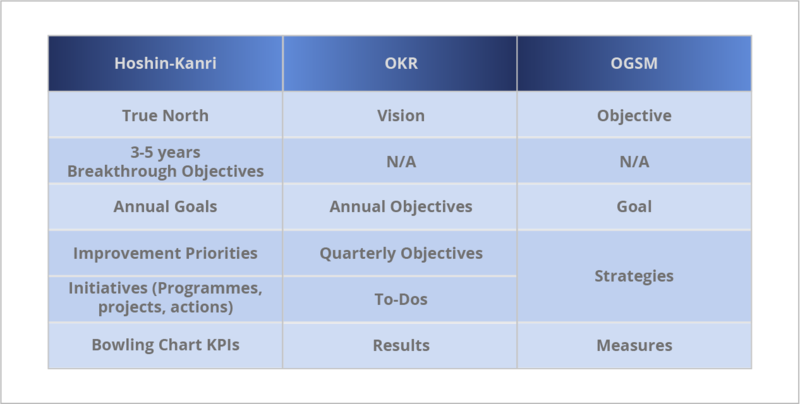 Note that the OKR cycle is not annual as Hoshin Kanri and OGSM, but quarterly, and that is why you will not have 3-5 years objectives in OKR. This is also why Google and other Silicon Valley organisations will favour OKR, whereas Hoshin Kanri is adopted more by the Lean organisations (which I’ll touch upon in a future blog). I hope you have enjoyed this content, if you have please share it! Want to learn more about the power of strategy execution software? Join me on an upcoming webinar where we take a closer look at the differences covered in this blog. Claim your spot by visiting the webinar sign up page, or come join us at a breakfast briefing designed to improve your strategy execution skills. Why you need to implement catchball for your goal cascading: Great strategies make use of the catchball process. 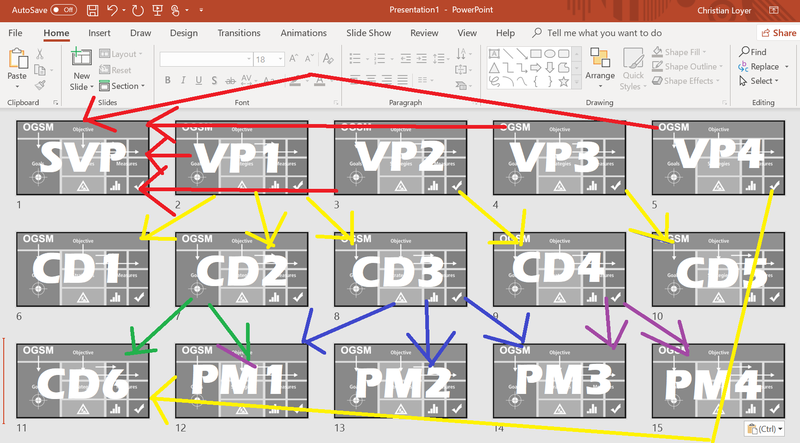 Here's what that means, how you can integrate it or optimise your current use. Christian is i-nexus' Head of Partner Development. With a rich background in the industry, today he uses his 20 years experience to make things more digital for our clients. He helps them to get away from the heavy lifting of executing strategy, managing projects and following-up on KPIs with spreadsheets, PowerPoints and SharePoint sites. With i-nexus he supports corporations in better executing their strategy, whether they use Hoshin Kanri, OGSM, OKR or any other methodology.